Imagine wrapping paper and note cards so delightfully endearing you consider framing it instead of wrapping with it. Click through to discover where to find such glorious paper goods. Imaginary Press are always fabulous for bringing to our attention that you need not spend hundreds – thousands even – of dollars on artwork. I love that they suggest framing the wrapping paper for an instant pop of Lo Cole cool to any room. Lo Cole has created a capsule collection of paper goods for Imaginary Press, including the aforementioned wrapping paper, available in a bounty of designs including Jolly Early Birds, Bugle Boys, Dogs’ Doodahs and Static Traffic, it’s priced £8 for four sheets. 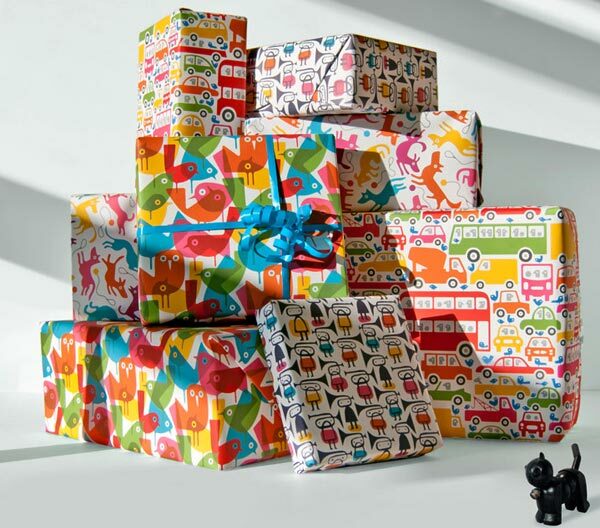 You can pair such fabulous wrapping paper with coordinating Lo Cole greeting cards (priced £2.50 each) or gift tags (available in packs of six for £3.95). Of course if you want to mix it up a bit or only have a couple of presents to wrap, take a beautiful short cut by way of a Lo Cole Wrap Pack. It includes one sheet of wrapping paper, one greeting card and two gift tags with string – all for just £4.95. Not only are gifts covered, taking noted has never been more stylish than with an Imaginary Press Lo Cole Notebook. A6 sized and displaying the uber cool, perfectly unisex Beastie prints, they’re available separately for £2.50 or you can lash out with a four pack for a very reasonable £9. See the whole Lo Cole collection at Imaginary Press, but be quick, they won’t last for long!